There are several options to utilize digital advertising for your Nutrition 2019 marketing message. There are several options to utilize digital advertising for your Nutrition 2019 marketing message. Other opportunities for digital advertising at the Baltimore Convention Center and the headquarters hotels are available. Please contact Keith Dillon, ASN Senior Director, Corporate Affairs/Vice President ASN Foundation at 240-428-3601 or kdillon@nutrition.org. DIGITAL NETWORK – Call for rates and availability. Include your video ad on ASN’s Nutrition 2019 Digital Network. Monitors will be placed in high visibility areas of the convention center for excellent exposure. Ads will run in a loop with other Nutrition 2019 content. The Nutrition 2019 mobile app provides useful information for attendees including the conference schedule, exhibitor directory and other general information. The mobile app will be heavily promoted 30 days in advance of the event and throughout the show. Attendees and exhibitors will be encouraged to download this useful tool to navigate Nutrition 2019. Supporter recognition prominently placed in non-educational tabs and sections of app. This opportunity keeps your company front and center with attendees as they utilize the Internet via WiFi in the convention center. Supporter will receive an initial login splash screen and the WiFi passcode can be your company or product name. 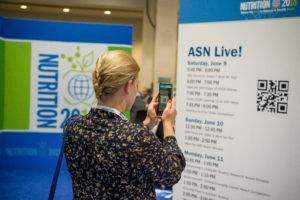 Let ASN send your custom message to Nutrition 2019 attendees via an e-blast. This is an excellent way to invite attendees to your booth, satellite event or social function held at Nutrition 2019. All sponsorship items are subject to change and availability.